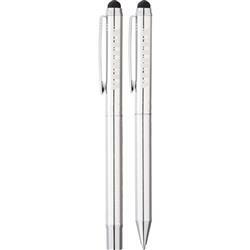 The Luxe Brighton Stylus Pen Set is the perfect executive gift. Set contains a ballpoint stylus and roller ball stylus. Pens have elegant ring etched bottom barrels, polished upper chrome barrels and a rubber touch stylus. Include premium blue ink cartridges. Customized with desired logo etched on center band. Pens wrapped in Luxe gift box packaging. 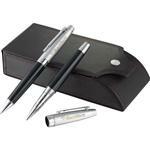 Aluminum pens, ring etched bottom barrel and polished upper chrome barrels, ballpoint stylus and roller ball stylus, premium black ink with included additional blue ink cartridges, Luxe gift packaging.